By the age of 14, girls drop out of sports twice as often as boys. According to the Women’s Sports Foundation, factors such as social stigma, lack of access, safety and transportation issues, costs and lack of positive role models, can all contribute to the reasons why girls drop out of sports in their adolescent years. If these factors can be addressed, I believe that more girls will remain involved in sport and physical activity throughout their lives. Firstly, sports can address gender issues and promote gender equality on a global scale. In the study “Girls, Sports and Equality: A State by State Ranking of Title IX,” public, co-ed high schools nationwide were surveyed and their gender inequality was ranked; Georgia had the greatest sport gender inequality at 66.3%. There is no state in the country which has achieved equality. This trend needs to change so girls can benefit from participating in sports because of the long-term positive effects it can have on their well-being and livelihood. The Women’s Sports Foundation’s report “Her Life Depends On It III“ reviewed data from over 1,500 studies that demonstrate the importance of sport and physical activity for women and young girls. According to the report, staying active and participating in physical activity can prevent chronic diseases such as obesity and heart disease, lower rates of substance abuse, reduce risky behaviors, and decrease rates of teenage pregnancies. Furthermore, girls will have better mental health, higher self-image and confidence levels, improved teamwork and communication skills, increased graduation rates, and leadership skills that can lead to achievement opportunities in school and at work. EY Women Athletics Business Network and espnW conducted a survey making the connection between women, sports and leadership. Out of 400 respondents, 74% said a background in sports can help accelerate a woman’s career; 66% believe that athletes make excellent candidates for jobs because they’ve developed a strong work ethic, can be a team player, and have the determination to be a great employee; and 75% stated that competitiveness is an asset to their leadership style in the workplace. There have been a handful of organizations working towards retaining girls in sports. Girls in the Game targets girls ages 6-18 from lower economic backgrounds in Chicago by addressing their physical, mental and emotional health through sport and fitness, nutrition, health education, and leadership development. Girls Athletics and Life Skills (GAALS) has a curriculum which, during their practices, pairs learning a physical skill with a life skill to promote problem solving, teamwork, and communication; they aim to build confident girls ready for their futures. Sporty Girls Inc. encourages girls from ages 8-18 in the Atlanta region to engage in non-traditional sports that aren’t readily available in local public schools. Laureus USA is committed to ensuring girls ages 6-18 are physically active, and we invest in programs which increase access to this population. One of these programs, Girls on the Run, does remarkable work by teaching girls life skills through hands-on lessons and running activities. Beyond girls having access to quality programs, it is important for them to see positive figures in both the media and their everyday lives to inspire them to stay involved in the game. They can look up to female leaders like Jen Welter, who recently became the first woman to hold a coaching position in the National Football League. They can look up to the US Women’s World Cup team, who became national icons. 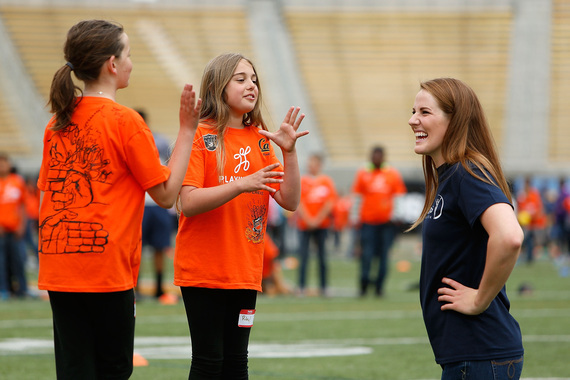 They can look up to women like Laureus Ambassadors Missy Franklin and Tamika Catchings. These two women are examples of females who dominate competitions; Franklin and Catchings have both committed their time to being positive role models for young girls. For example, Catchings founded the Catch the Stars Foundation to “empower youth to achieve their dreams by providing goal-setting programs that promote literacy, fitness and mentoring.” There needs to be more individuals such as Franklin and Catchings advocating for female youth participation and retention in sports, acting as positive role models for young girls, and breaking down social stigmas. Beyond professional athletes, every community has the potential to provide positive female role models to be inspirational figures in a young girl’s life, such as coaches. 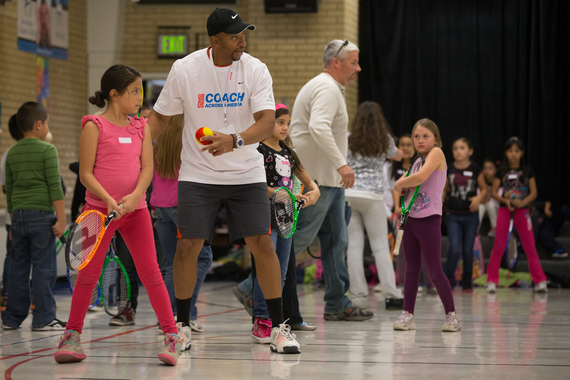 Nonprofits such as Laureus USA, Girls in the Game, Sporty Girls Inc., Girls on the Run, and Catch the Stars Foundation set the precedent to develop programs targeted to girls and promote sport and physical activity for a healthier generation. I hope others will join us in our mission to keep girls active and positively impact future generations through sport. Next articleWait, the Final Season of ‘Game of Thrones’ Might Not Air Until When! ?